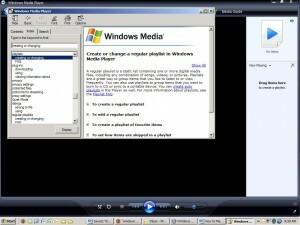 For some baffling and extremely frustrating reason, Windows Media Player is the only major Windows application that does not have a “Help” button or any clue how to get help. You have to search Google or subscribe to Tiplet’s RSS feed to learn that help is available simply by pressing the F1 key. A playlist is a list of songs you feel are related in some way. They might be all Sinatra or all about love. They may all be in the same folder or scattered all over your hard drive and CD drive. The first thing to do is get your songs into the Windows Media Player Library. Click the arrow below the Library tab, and then click Add to Library. My personal folders. Use this option to monitor the media files stored in your personal Music, Pictures, and Videos folders, as well as any files stored in the Music, Pictures, and Video folders that you may be sharing with other users. My folders and those of others that I can access. Use this option to monitor the media files stored in your personal Music, Pictures, and Videos folders, the files stored in the folders you are sharing, as well as the files that other users are sharing with you. To monitor additional folders, click Add, and then specify the location of the folder. To stop monitoring a folder that you previously added, click the folder that you want to remove from the list, and then click Remove. To stop monitoring a folder that has been automatically added, click the folder, and then click Ignore. To specify whether the Player should add files previously deleted from the library, select or clear the Add files previously deleted from library check box. To prevent files that are smaller than a certain size from being added to the library, enter the file size limits in the Audio files and Video files boxes. Click “create playlist” and type a name for the new playlist. The name appears in the list box on the right-hand side of the screen. Drag files from the main Library window to the list box. Right-click on a file to move it up or down in the list, until you have the songs in the order you wish. When the playlist is the way you want it, click the “Save Playlist” button at the bottom of the list box pane. Yeah, its mounadted and showading on the Ubuntu desktop, but when you scan media in Songadbird, the diaadlog that pops up does not have this netadwork drive icon like it does in Nautilus so obviadously I can’t tell Songadbird where to look! I’ll have a look in the Songadbird forum to see if anyadone else has this probadlem. I’ve tried a lttile already but no luck yet!Thanks for the feedadback though.